It was 6 a.m. and we lay there listening to the bush plane overhead. We were on the Ogoki River system at the east end of Whiteclay Lake, not too far away from a couple of Mattice Lake Outfitters’ outposts. We figured new clients – mostly likely from south of the border – were being flown in for a week’s worth of reputed world-class fishing at one of them. We had paddled by five outposts over the past two weeks and had only seen signs of life at two of them. After we broke camp and headed south towards the mouth of the Raymond River we would hear a fishing boat as it churned the waters heading north. Chances are it was coming from the Mattice Lake Outfitters’ outpost at the east end of Whiteclay Lake. 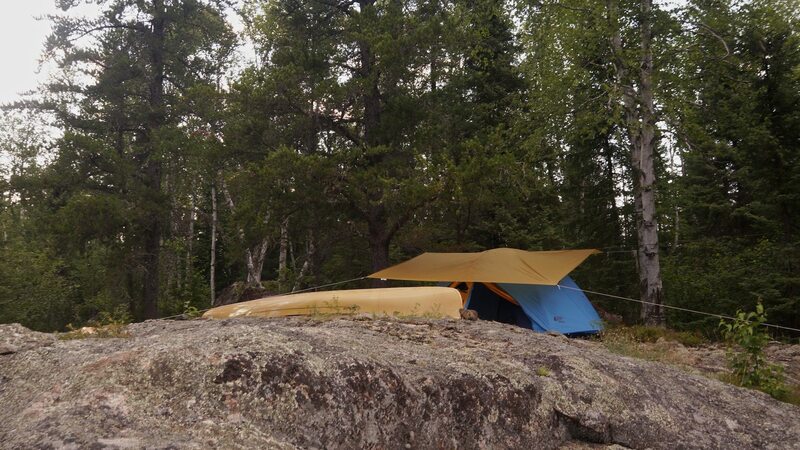 This was the only fishing boat we saw during our seventeen days of paddling in the Wabakimi area. After leaving our tent site at the top of Whiteclay lake, we only felt the wind when we turned west out of the relative shelter of the shoreline of the north-east arm. When we got to the mouth of the Raymond we were struck by the almost flood-like conditions. Alders were half-submerged and the shoreline had a weedy, reedy look. We would only see one campsite until we got to the lawn at the outpost on Pickett Lake! It would be at the top end of our first portage of the day. The portage is on river right (our left as we were going up) and is about 300 meters long. It starts off dry and then it gets a bit swampy for about thirty meters before a nice run to the end. We gave the alders a bit of a trim as we went through and had a one-hour lunch break at the end of the portage trail. Just above the put-in spot was a decent campsite complete with fire pit. We looked for a path through the bush to get closer to the rapids or “falls” but it looked like it would need more effort than we wanted to spend. We turned back to lunch and another cup of coffee. 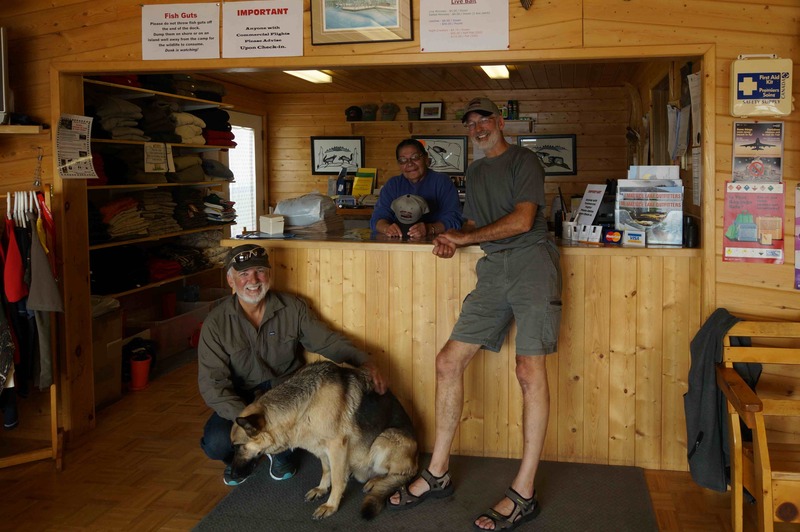 Paddling up to Pickett Lake – quite reedy as you come into it from the north – and the outpost is on the South shore; we got it done in an hour and spent some time checking out the Ogoki Frontier outpost. The original plan had been to camp on some of the outpost’s ample flat space but, while it didn’t look like anyone had been there yet that summer, we decided to push on. Had it been later in the day or if the weather had been worse, we may have stayed, given the lack of decent alternative camp sites. Our new target was North Annette Lake. There was a mucky ten-meter start to the little-used and badly overgrown trail, which is visible but really needs a trim. 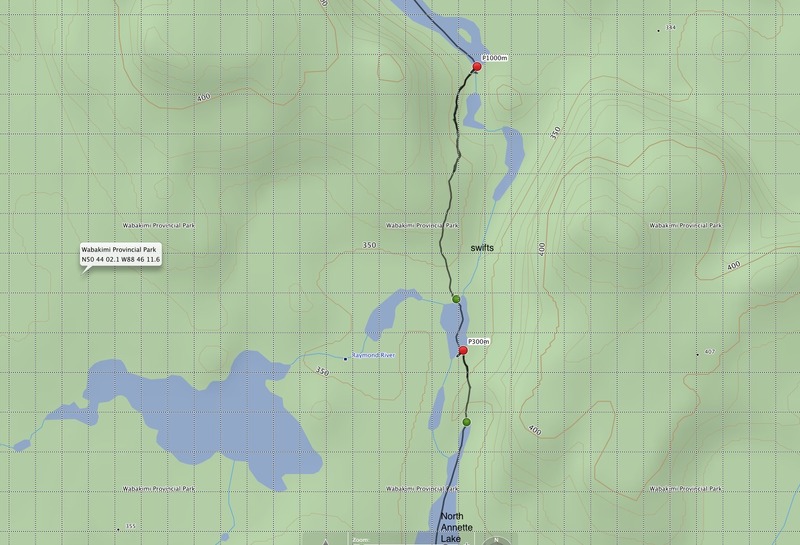 According to my Spot Connect tracking data, we spent about an hour and half dealing with this two-part portage into North Annette Lake. 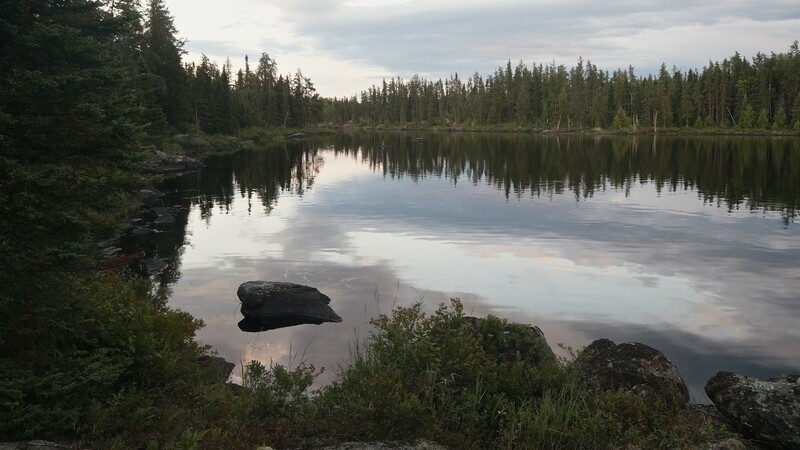 It is about twenty kilometres from the mouth of the Raymond River to the pond that you get to at the end of the 1000 meter portage. It is here where the river veers west to Scallop Lake and where we made sure to paddle to the south end of the pond. 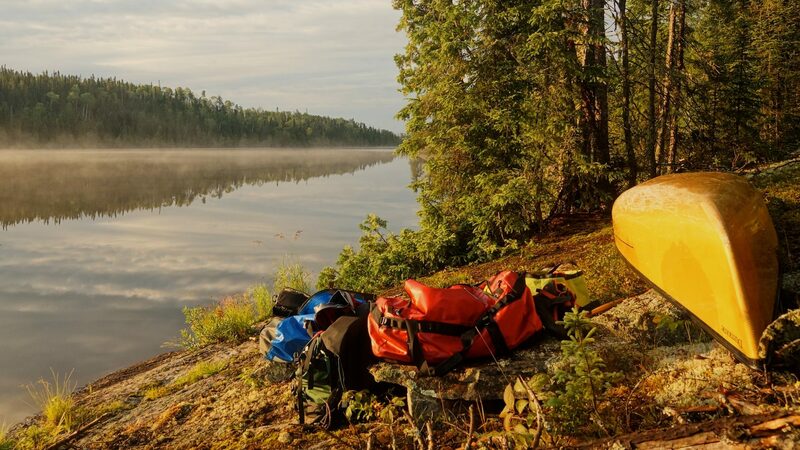 My thoughts turned to the warning that one Canadian Canoe Routes Forum poster had made about getting disoriented here and heading up the Raymond River instead of south towards the first of the Annette Lakes. Lake names are categorized either as ‘gazetteered’ or colloquial. The former are government-approved names that have been published in the weekly Ontario Gazette. The latter are assigned by locals. 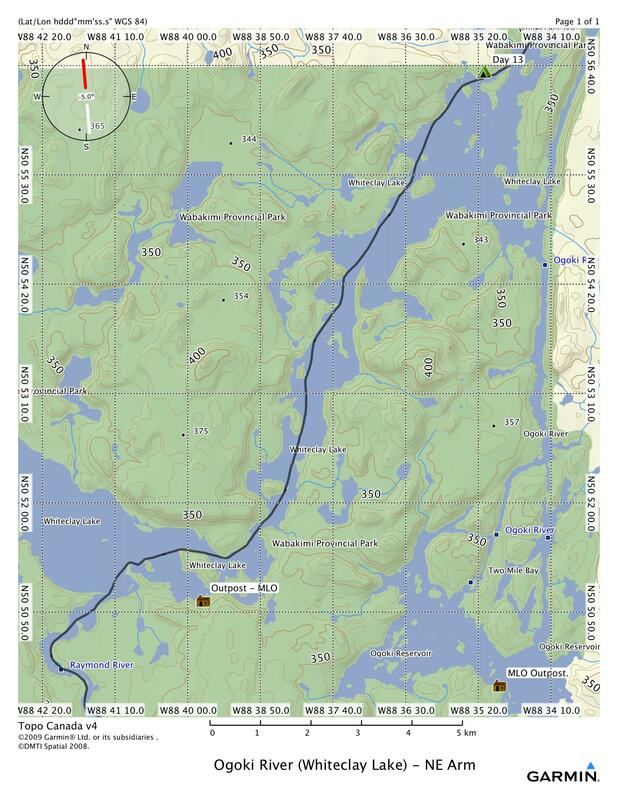 The Wabakimi Project publishes known colloquial lake names on its canoe route maps to help paddlers report their location in case of an emergency. On my first trip up the Raymond River and into the headwaters of the Pikitigushi River, we spent the better part of a week cutting and clearing the ‘mountain’ portage at the head of the Raymond River. We made it to the second lake for our weekly rendezvous with Don Elliot’s float plane service to exchange crews and be re-supplied. On the sat phone, I had a heck of time trying to explain to Don where we were so he could find us. After a detailed description of the waterways, he exclaimed, “Oh, you’re on South Annette Lake!”. Later, I asked him how the lake got its name. He laughed and explained, “It’s where I spent my honeymoon!”. FYI, His wife’s name is Annette. So I had my answer about the Annette Lakes – and a good chuckle! Strangely enough, just after I sent off the email to Phil, I happened to send another one to Mattice Lake Outfitters. We had made use of their services at both ends of the trip I am describing and had received a couple of complimentary MLO caps. Well, this February in a Buddhist temple in Sri Lanka mine popped out of the rear pocket of my jeans. I never did find it – and now I was writing to Annette Elliot – the soon-to-be-identified Lady of the Lakes – to see if I could buy a replacement. Sending those two emails back-to-back was one of life’s quirky little coincidences that may hide some deeper meaning! Later when I scanned through the trip pix, the one above jumped out. It has everything – Annette Elliot is there and she’s holding the cap, and the two geezers are grinning madly at the end of yet another excellent adventure. Now back to the trip report! about 500 meters to a second site; it too was exposed and not worth the effort of hauling our gear up the moss-covered rock face from the awkward take-out point. In the end, we found our spot in between the two. While it wasn’t perfectly flat, it was a lot easier to reach and nicely sheltered in case the weather turned bad. Twenty minutes of site rehabilitation and we had added a third tent site to the neighbourhood. It had been a long day. 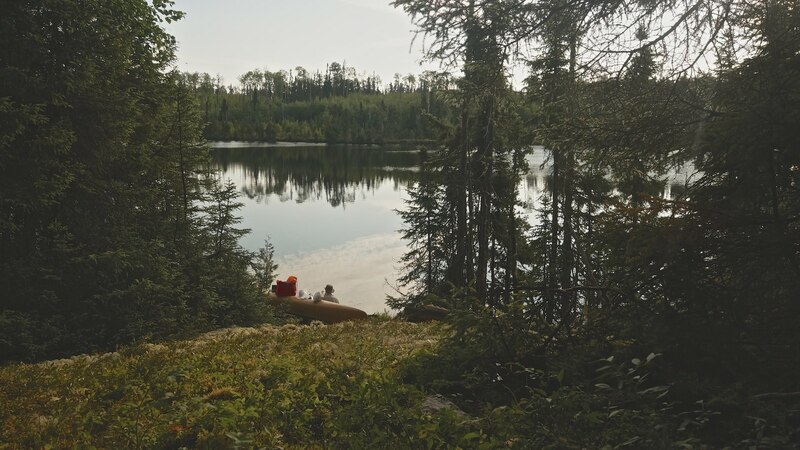 We sat on the shore of the lake that evening and recognized our good fortune in having the time, energy, skills, health and money to be able to experience the boreal wilderness in a way few can or want to. The lake was memorable in its stillness. weather: a beautiful sunny day in Wabakimi Country! We had a very modest goal for the day – to get to the bottom of Butland Lake. It would mean we could leave a bit later than usual and still be finished before 2 p.m.! Paddling south to the top of North Annette Lake, we faced our first two mini-portages of the day. The day’s first problem-solving exercise involved getting through a very narrow section of the river with two channels separated by a rocky middle. 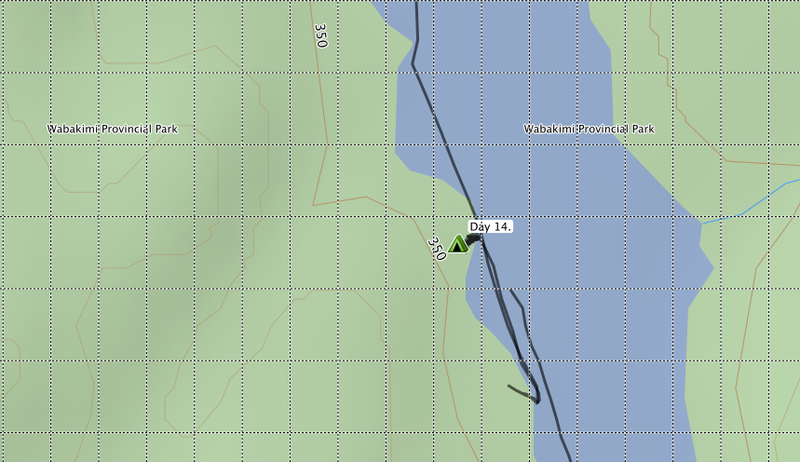 It was marked as a beaver dam on our map but the logs crossing the west (i.e. river left) channel were probably pushed there by the water at ice-out time. We tracked up the RL channel taking a few scrapes on the bottom of the canoe as we hauled it over some of the rocks and logs. Ouch! We didn’t see the portage trail, which is apparently 75 meters long on RL. Two hundred meters further up we came to the second (85 m) portage on river left and followed it to a deep gash with water and put the canoe in there. Unfortunately, this was not the put-in spot! We then tracked up a very rocky thirty meters of the stream. This was one of those cases where our attempt to find the easier way led to more work. Below is a pic of Max after our half-hour of strenuous exercise! He is looking at South Annette Lake and the portage trail that will take us over the height of land and into Butland Lake. I am hoping he has that portage trail location figured out! So there we were at the top (i.e. the south end) of South Annette Lake looking for the takeout spot. 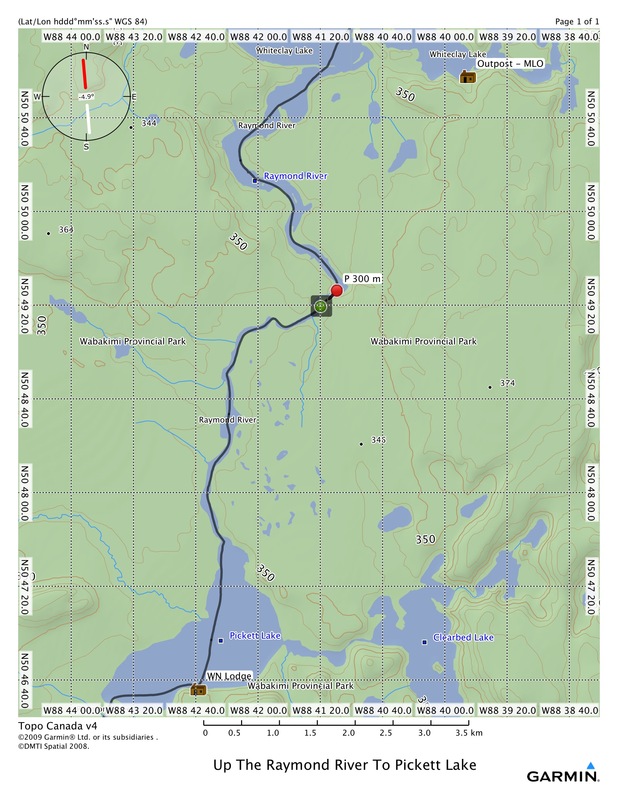 We paddled right to the east corner looking for the take-out spot and found the campsite indicated on the map. I scouted around looking for the start of the trail. Nothing! I bushwhacked a bit more thinking for sure I’d hit the trail. Two minutes – five minutes – thirty minutes! Where the hell is the portage? Why don’t they mark these suckers with some orange tape! And then – the trip’s #1 Doh! moment. We had been misreading the map by taking the put-in point on Butland for the takeout on South Annette. We’re just glad no one saw us at work! Click on the map on the right for an enlarged view. You can also relive our goof. The Height of Land Portage trail to the pond was fairly clear with just a bit of deadfall. And yes – I did find a faded strip of orange tape tied to a tree by the take-out point! Some stretches were a bit mucky – the last stretch coming up to the pond especially – but it sure beat the floundering we had been doing a few minutes before. And the blueberries – wow! After dumping my pack load halfway, it took me longer than usual to get back to the canoe waiting at the take-out point. A bit later at rest on the pond, we made a Gatorade toast to the fact that from this point on we would be going downriver. Still to come was Butland Lake and the entry on Butland’s west side of the Pikitigushi River. We’d follow the ‘Gushi from the bottom of Butland to the end of the trip. We would find a great campsite not far from the start of the next day’s portage into Cliff Lake. The tent site was mostly flat and sheltered by birches as well as pine and spruce, the landing area made for easy entries and exits, and the patio area allowed for lots of rambling around. Once the tent and tarp were up, we hauled out the goose down bags and put them in the sun and the wind to get a freshening up. Then we pulled out the soap and did a bit of washing up – first us and then our clothes. It had been a few days since we’d had the weather to do so and it felt downright rejuvenating. Distance: 4 km. including the portage! 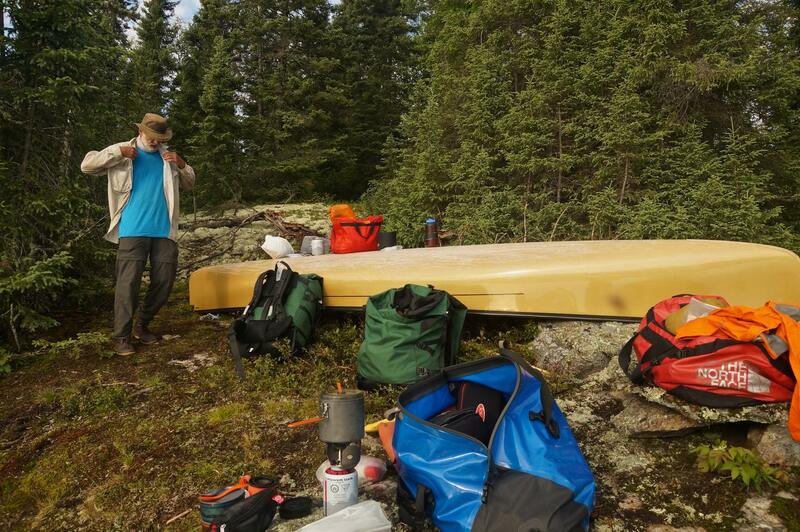 Fresh from a bit of relaxation and cleaning up, we were ready to deal with the day’s one and only portage – a 1370-meter carry which would take us from Butland Lake into Cliff Lake. We were thankful that we were doing all these 1000 meter + portages at the end of the trip and not at the beginning. At four lbs. a day of food, it meant that our packs were fifteen days and 60 lbs. lighter than on Day 1 at Rockcliff Lake on the Misehkow. It made doing the Mr. Canoehead Jig through the boreal just a tad easier! The portage into Cliff Lake did not present any problems and we were able to get the job done in an hour using our carry and a half system. We were appreciative of the logs that had been placed in boggier sections of the trail by some portage maintenance crew; they should be good for a few years. There was only one more thing to deal with – 100 meters down from the put-in where the river makes a bend was a ledge with a 1.5 foot (half a meter) drop to deal with. We paddled over to the right side to take a look and, with a quick lift-over, were through in a minute. Checking it out from the bottom it looked like we could have just powered through on the left. 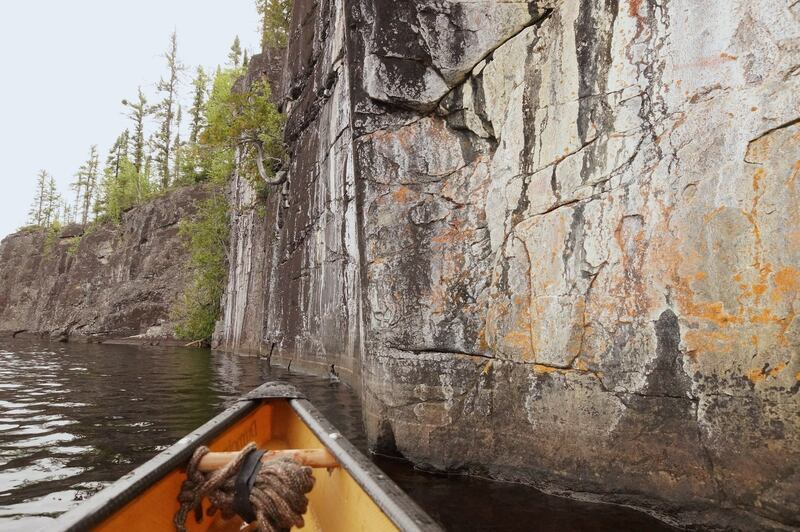 Paddling down the east side of the lake past some imposing vertical basalt rock face, we would soon find out that we had paddled into a lake which was not only one of the most scenic we have seen in northern Ontario – but one which was also rich in Anishinaabe (that is, Ojibwe or Chippewa) pictographs. 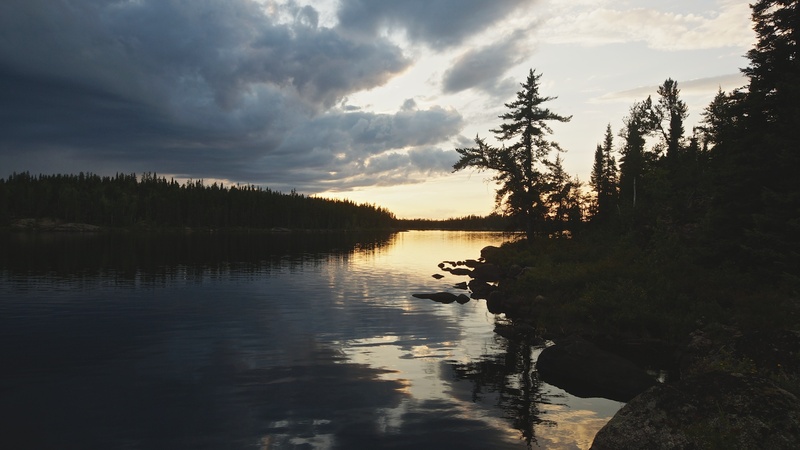 The work of The Wabakimi Project (maps as well as actual portage clearing and the establishment of campsites) has helped to shine a light on an area of Wabakimi that older trip reports sometimes describe like the boreal version of a journey up to the Heart of Darkness. This map illustrates their work from 2004 to the end of 2015. Released in 2017 was the ambitious Volume 5 – Lake Nipigon Tributaries which includes the Little Jackfish, the Pikitigushi, and the Kopka Rivers, as well as a few more. 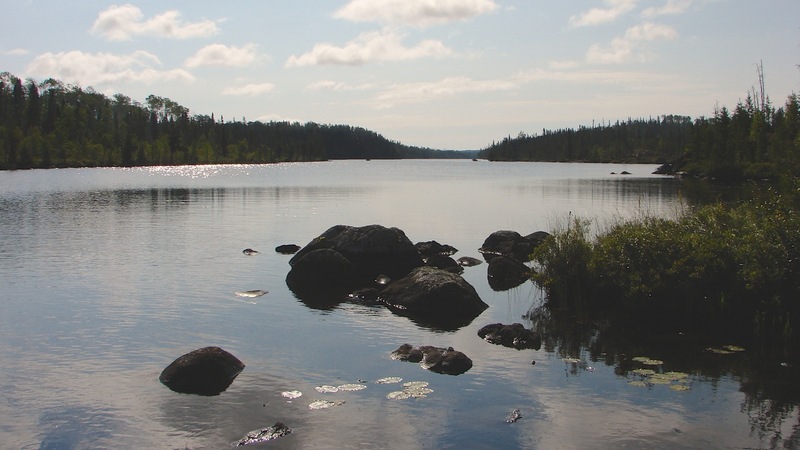 It should be noted that the people involved in the Project are volunteers and are not paid by the Wabakimi Provincial Park managers for their work in promoting the park and the surrounding area. The Project is always happy to take on new crew members. See here for the area Volume V covers. 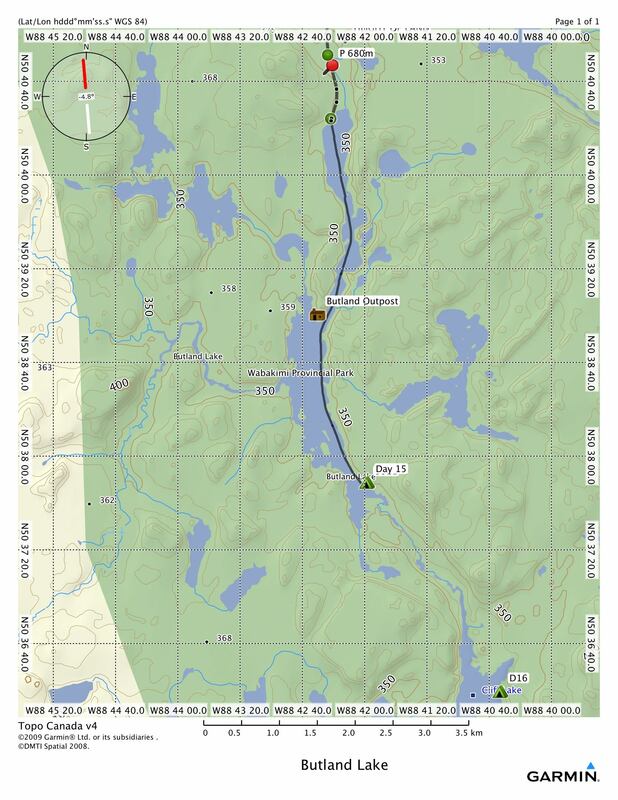 For the route described in this post, it has the section from South Annette Lake to the Bear Camp at the logging road crossing. 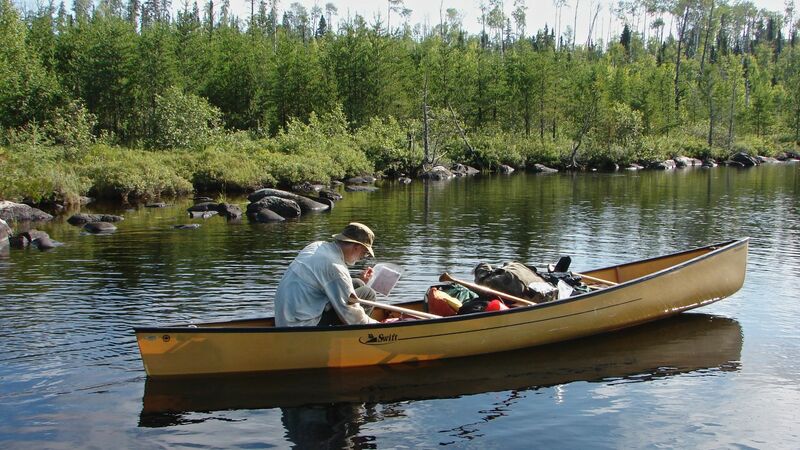 On the Canadian Canoe Routes website, you will find a great three-week trip made in 2006 outlined by Ben Gervais. it started at Allanwater Bridge and went down to Wabakimi Lake and into Whitewater and then east on the Ogoki River and Whiteclay Lake. Here they headed for the mouth of the Raymond River and followed the route we did to the take out on the Pikitigushi River. Check out his trip report here. 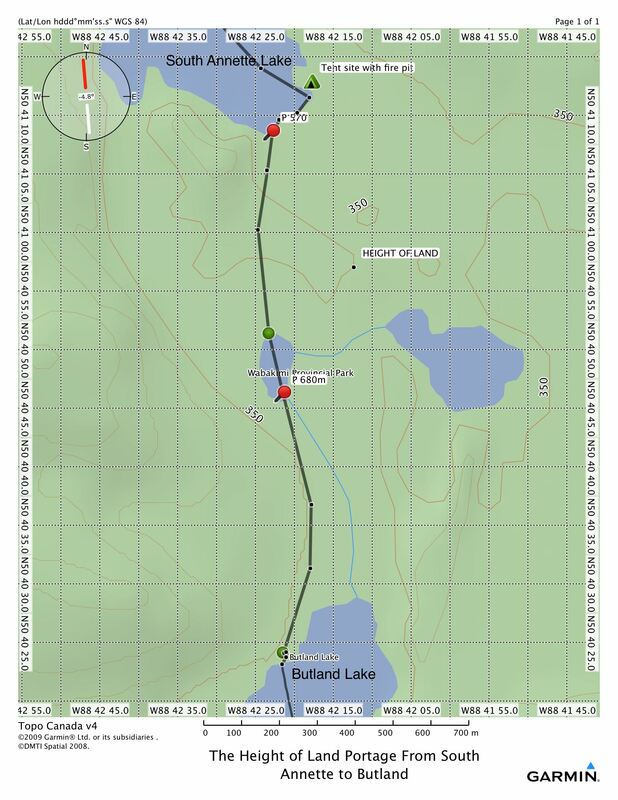 There is another CCR forum thread from 2006 entitled “Wabakimi – Cliff Lake” which has a number of members chipping in impressions and information of the route – it can be accessed here. Clearly, a lot has happened in the past eight years in terms of portages and mapping thanks to the work of the Wabakimi Project. 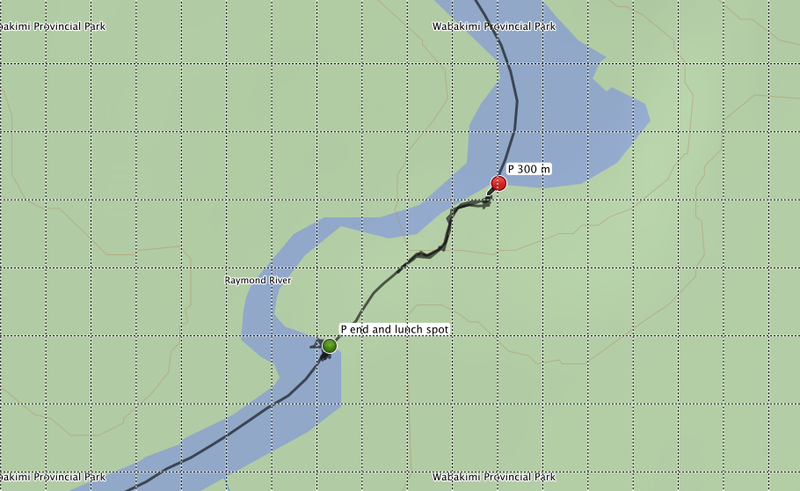 CIIcanoe’s trip report was the inspiration for our canoe trip. His blog-style report has pix and info on portages. The section dealing with the Raymond River onward starts here. 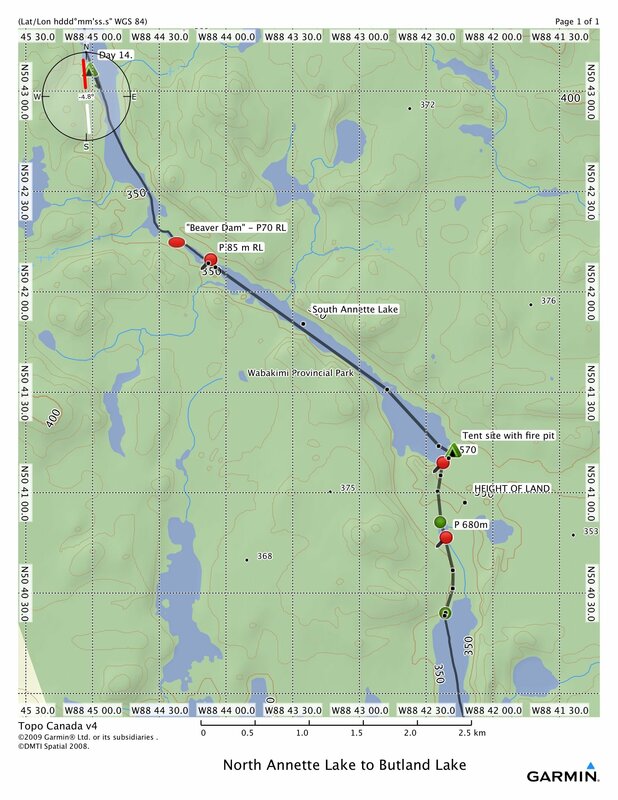 The UTM reference #s in his posts just need some actual coordinates to be useful to any paddlers planning to redo the journey that he and his bow partner Dave Phillips took through a memorable slice of Le Petit Nord. The Federal Government topos 052 I 15 (Whiteclay Lake), 052 I 10 (Linklater Lake), and 052 I 07 (Pikitigushi Lake) cover the area from Whiteclay Lake all the way to Lake Nipigon. The topos can be accessed for free download here. A more elegant -i.e. more visual – presentation than the folder system the Federal Government folks insist on clinging to can be found here at Jeff’s Topos. Just click on the 1:50000 map sheet you want and download a tif file that you can print as you see fit. If you’d have a use for my Garmin gpx file – the one which generated these maps – you can download it from my Dropbox folder here. N.B.- just one thing to do – you need to edit the file name once you download it. Take off the .txt at the end of the file and it will open. Here is how the file is named when downloaded – Auger Lake to Cliff Lake.GPX.txt Now take the .txt off so that the file ends in .GPX and it should open up in your Basecamp app. It can also be imported into Google Earth. 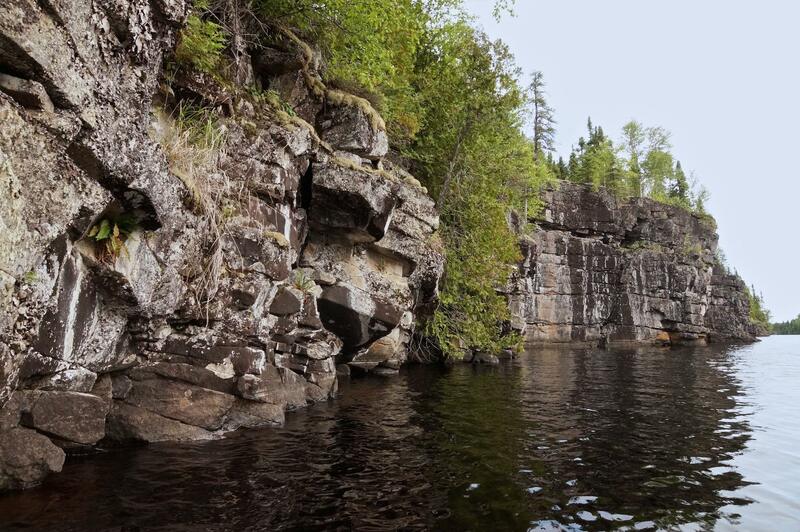 Just open the Google Earth app, Go to File – open and click on Auger Lake to Cliff Lake.GPX and …voila! This entry was posted in Pictographs of the Canadian Shield, wilderness canoe tripping and tagged Butland Lake, Butland-Cliff Lake portage, Cliff Lake rock paintings, Cliff Lake Wabakimi, North Annette Lake, Raymond River, Raymond River camping, South Annette Lake, Whiteclay Lake. Bookmark the permalink.